January 31st marks the beginning of the Chinese New Year. In celebration, Haywire Wines has released a limited edition Pinot Noir. To commemorate the release of this exceptional vintage, TownHall and Okana­gan Crush Pad invited me to a wine paring event focusing on Asian food and wine pairings. 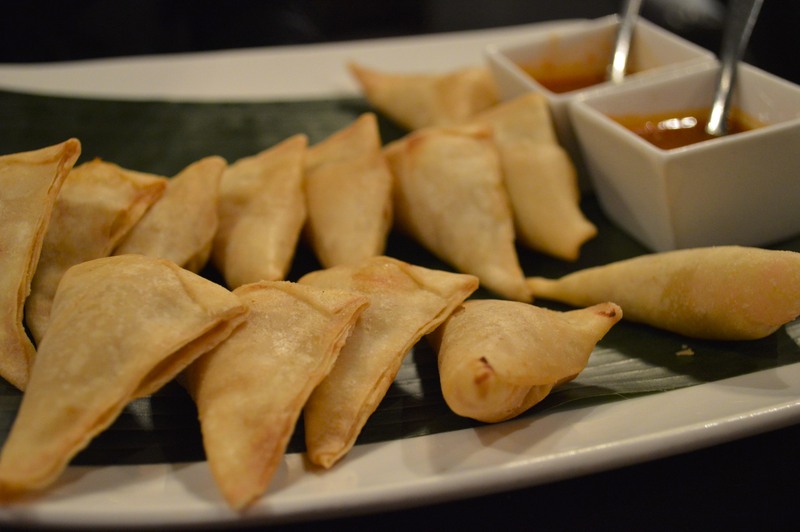 Okana­gan Crush Pad has introduced a guide to pairing BC wines with Asian cuisine to celebrate the Year of the Horse. 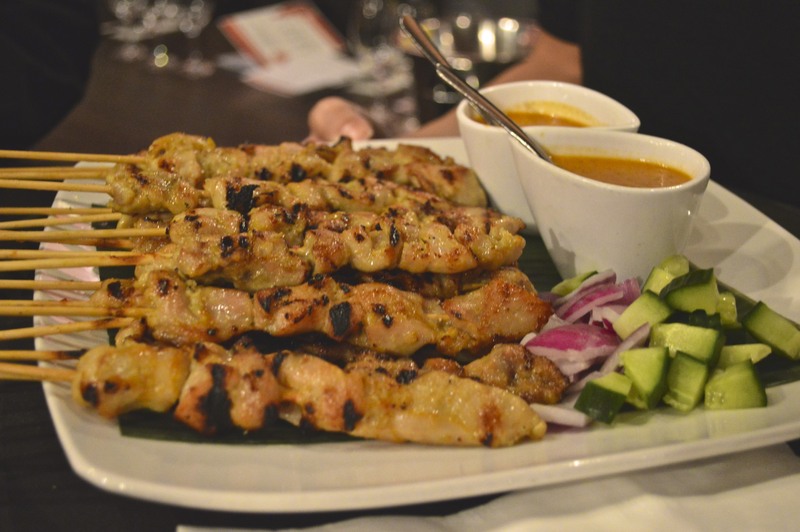 The event took place at Kaya Malay Bistro with dishes created by Head Chef Lim. The menu was inspired by the countries of Japan, China, Taiwan, Vietnam and Korea. This was truly an extraordinary culinary feat! This two appetizers were paired with Haywire’s The Bub 2012 sparkling wine. I found this wine so versatile and easy to drink. Made with 51% Pinot Noir and 49% Chardonnay, this wine features some mineral qualities, giving it a refreshing character. Goes perfectly with any spicy dish or own its own. Following our appetizers, we started our 10-course culinary adventure. 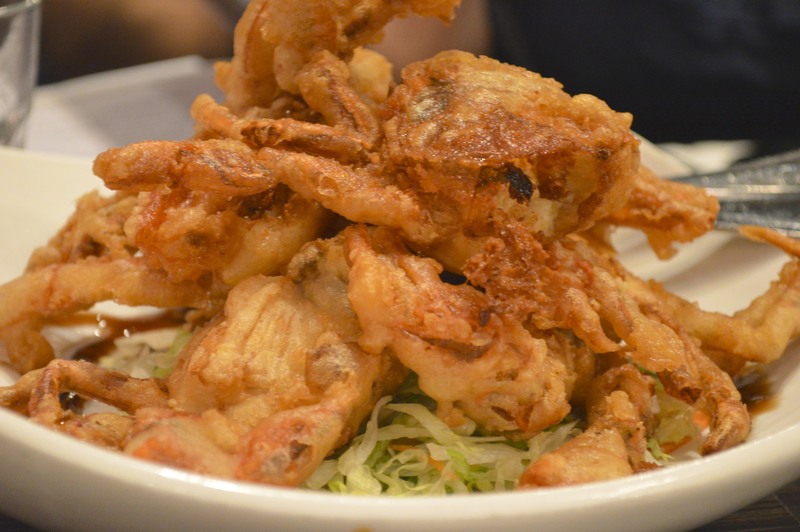 We began with Japan and the deep-fried soft shelled crab. The crab was dipped in tempura and then fried. This dish was paired with the Haywire Gamay Noir Rose 2011 – a light wine with notes of raspberry and rhubarb notes. 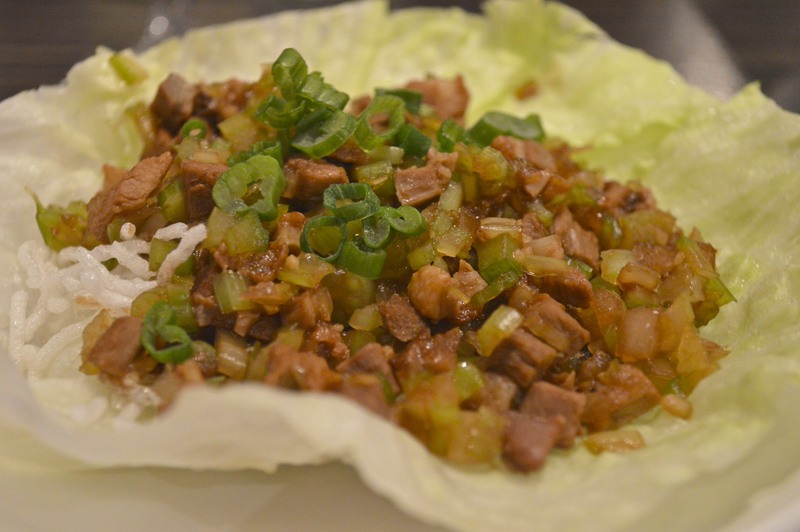 Another Japanese dish followed next: the BBQ duck salad with Cantonese dressing. This dish was also paired with the Haywire Gamay Noir Rose 2011. This dish played well with the refreshing taste and mild tannic structure of the wine. 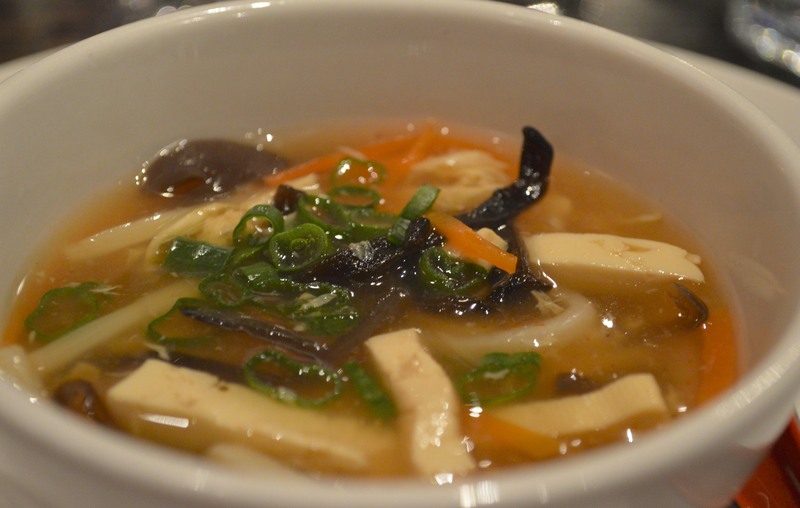 On to the next course, and next country – China and the Mandarin hot and sour soup with seafood, tofu and Chinese chives. This dish was deliciously paired with the Haywire Gewürztraminer 2012, a wine filled with grapefruit, floral and fresh aromas. The crispiness of the wine brought the flavours out of the dish quite nicely. This next dish was my favourite of the evening: the Thai seafood soup. 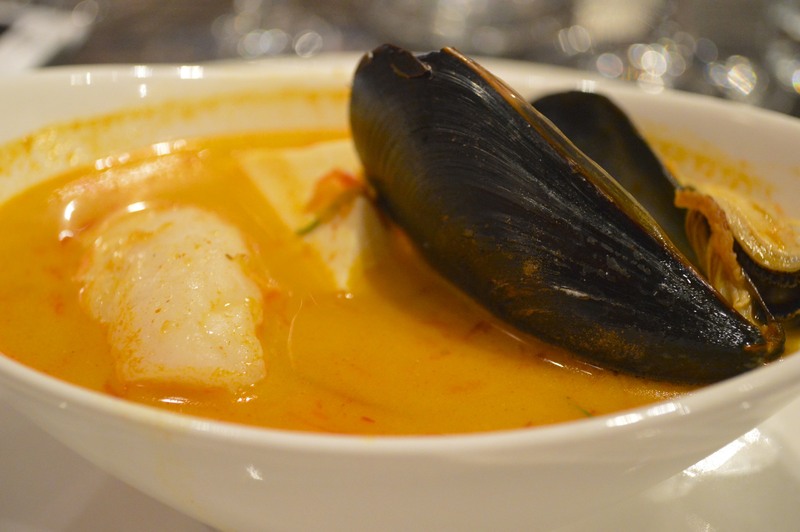 This dish had lots of seafood like shrimp, mussels, and squid mixed in the most exquisite and fragrant curry. Another great paring to the Haywire Gewürztraminer 2012. 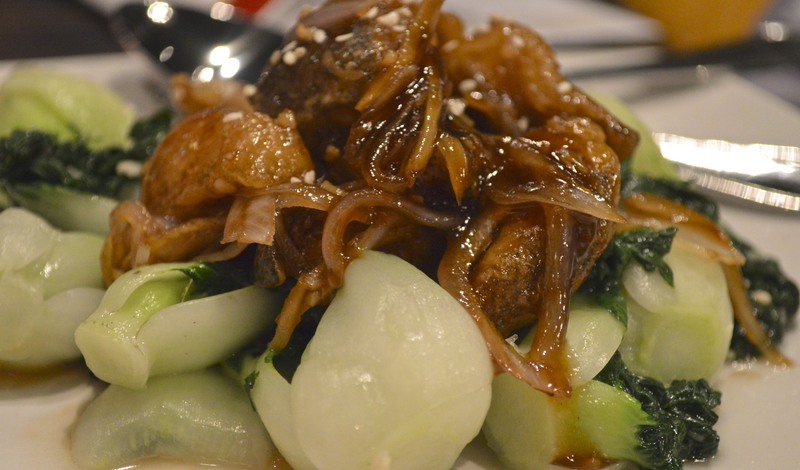 Next up is a Taiwanese dish – stir fried eggplant. 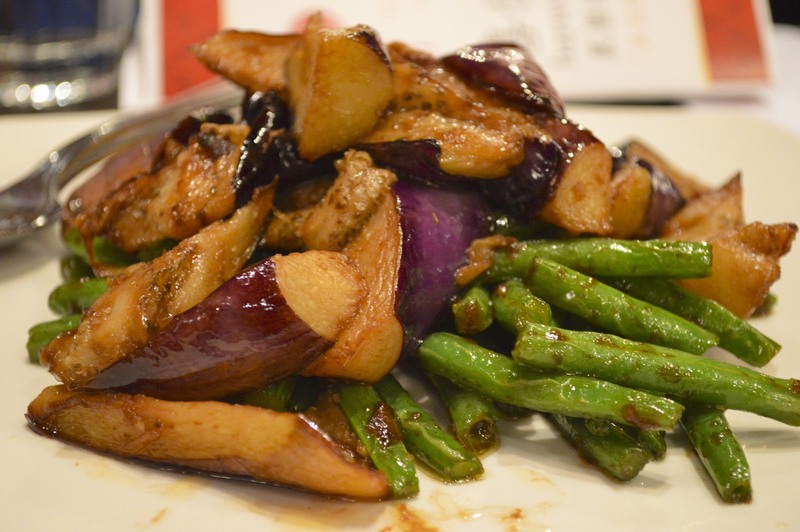 The eggplant was delicious, but the green beans were the real star. So crispy and mildly spicy. 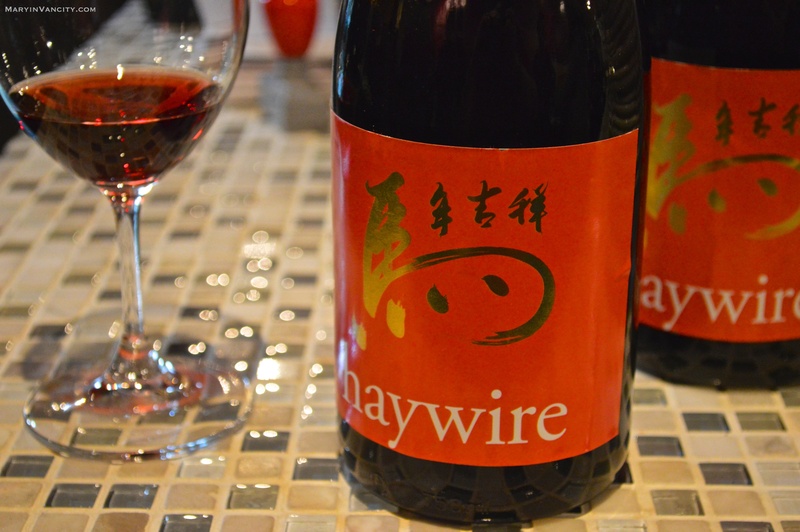 The Haywire Pinot Noir 2012 is a great pairing with spicy dishes. This is a special limited release of 688 bottles labeled in celebration of the Lunar New Year and to welcome the year of the Horse. Representing Korea we have the Korean-style grilled sablefish. The Haywire Pinot Noir 2012 with notes of cherry and light tannins was a good pairing for the strong taste of the sablefish. 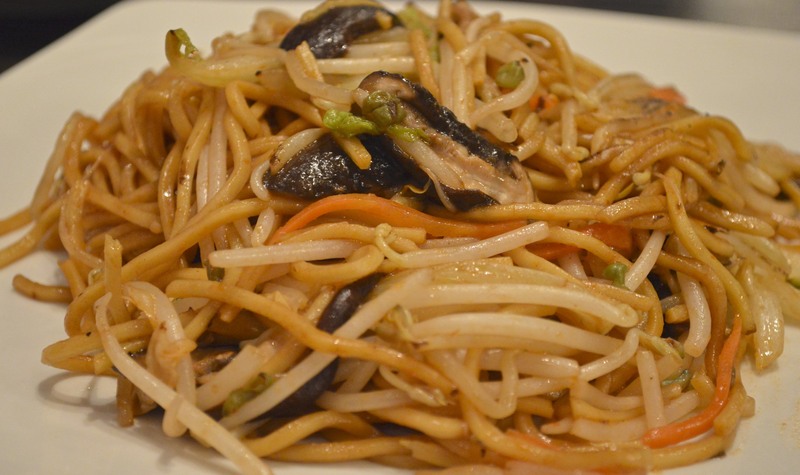 The next dish was kaya wok-fried egg-noodles with shiitake and siuchoy. The noodles were served with the Haywire Switchback Vineyard Pinot Gris 2012. 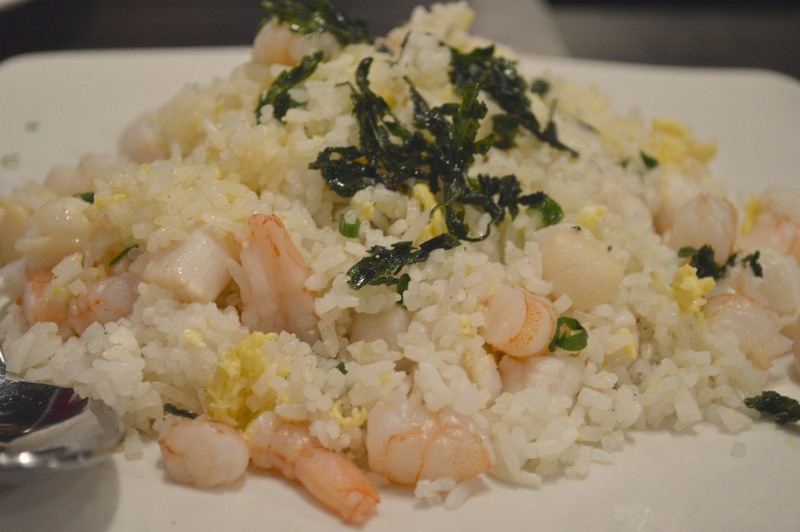 The Haywire Switchback Vineyard Pinot Gris 2012 has a mineral qualities balanced with fruit notes and a creamy mouthfeel, which went well with our dish from Vietnam – a mild tasting shrimp and scallop fried rice. 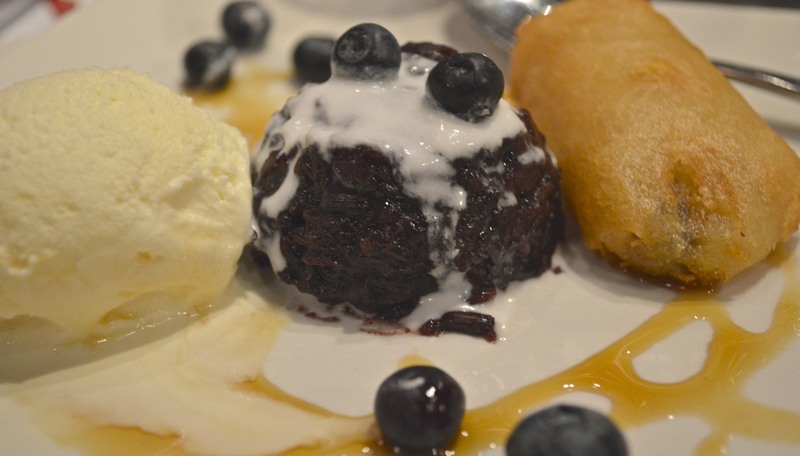 Dessert came in the form of a berry and rice pudding and a deep-fried banana with vanilla ice cream. It was paired once again with the Haywire Gamay Noir Rose 2011 and the Haywire The Bub 2012. This menu was absolutely delicious and made complete by the Haywire wines. I was very impressed by Chef Lim’s creations. Follow them on Twitter at @KayaMalay. My favourite wine was The Bub. It was so versatile and easy to drink and it paired well with pretty much every dish, or on its own. 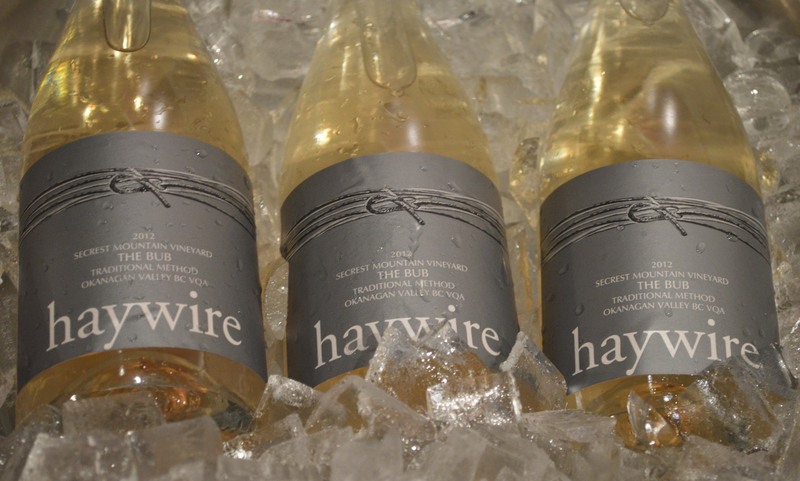 The Haywire wines are made at Okanagan Crush Pad winery in the interior of BC. The winery is open June 1 to September 30 10:30am to 5:30pm daily. Bottles of each wine can be found at Marquis Wine Cellars and Kits Wine Cellars, for less than $25 per bottle! The winery also has an office in North Vancouver were you can purchase wines by the case. Follow them on Twitter: @OKCrushPad and @Haywirewine for more details. Thanks to the @TownHallBrands team for putting on an unforgettable event! Thanks for sharing your experience, Mary!